Remove skin and chop potatoes in medium size chunks. In medium pot covering with water bring to a boil. 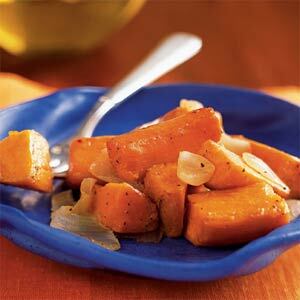 Once boiling reduce to a simmering cooking for 10 minutes until sweet potatoes are soft when forked. Preheat hot skillet, add olive oil and heat for 20 seconds. Then add sweet potatoes garlic and onions cooking for 3 minutes until onions and garlic turn translucent and become caramelized. Top hot potato garlic and onion mixture with drizzled agave and serve.